I’ve been playing Battlegrounds longer and with more consistency that I have played any other multiplayer game, and this cinematic fan-made trailer helps express why. PUBG has been a game that I haven’t burned out on, and I’m always down to play a couple fast games. If I’m not playing it, it’s because I’m pressed for time and have other things to do, not because I’m not still enjoying it. The variety of interactions, the sheer number of things that can happen with a finite number of guns, geological features, and vehicles, keeps me coming back game after game. Battlegrounds isn’t the first multiplayer game that I’ve enjoyed, but it is the first one that I’ve had this always-exciting relationship toward. I don’t ever seem to get tired of it, I love the maps, and I think that the new content coming down the pipeline seems interesting as long as it doesn’t mess with the core experience. I’ve watched this cinematic fan-made trailer for the game, created by a YouTube user called Awkward Monkey, a couple times now. It captures exactly why I enjoy PUBG more than any of the other multiplayer games I’ve put time into. It’s a tactical game, but it’s also a game about driving cars around in the most outrageous ways possible. It’s a game that rewards pinpoint accuracy as much as it rewards “Yakety Sax” running in and out of defensive structures. 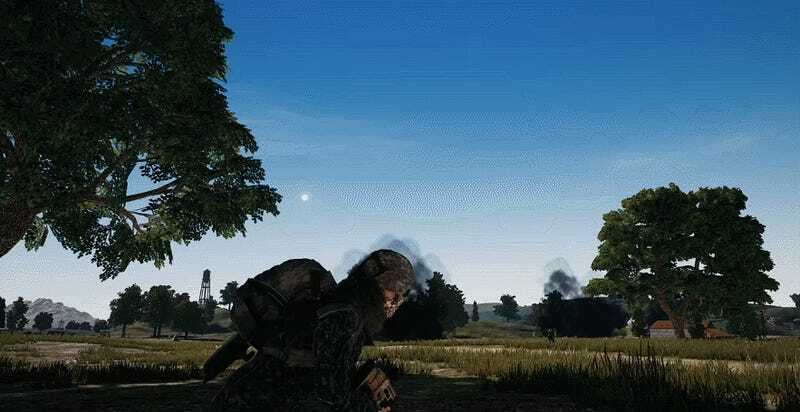 PUBG is often clunky, but it’s clunky because it is such an open system that allows for so many ways of navigating its world and fighting with other players. Awkward Monkey’s trailer shows the thrill of making it around a corner to avoid gunfire, getting into car chases, and doing a tactical barrel roll in a small sedan. It shows how great it feels to lean into the clunkiness instead of being frustrated by it. There’s an emergent, ephemeral joy that comes out of how strange the game often is that other games, even ones in the battle royale genre, can’t seem to evoke for me.